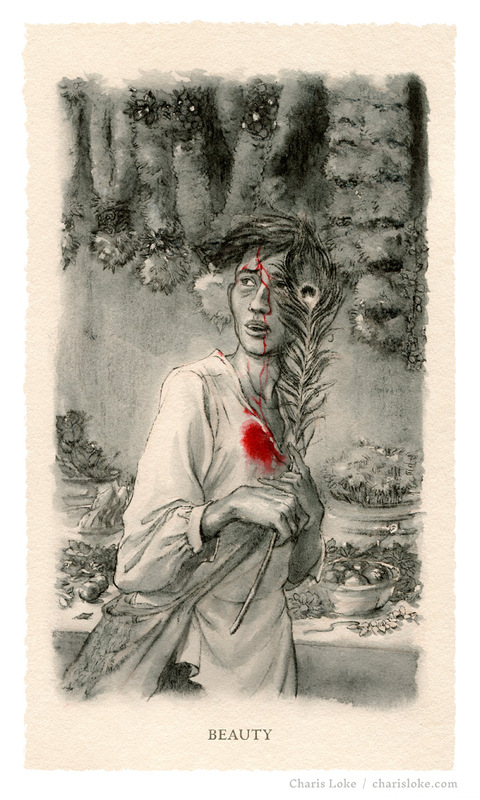 TRUTH AND TEARS: Interior illustration for Kejora. BEAUTY: Interior illustration for Kejora. JANGGUT BIRU: Interior illustration for Kejora. GRIT AND GOLD: map based on Tyler Whiteside's 'The Thousand Deaths of Ardor Benn', created for a SmArt School class. Character illustrations for bookmarks based on the YA novel THE WEIGHT OF OUR SKY by Hanna Alkaf. 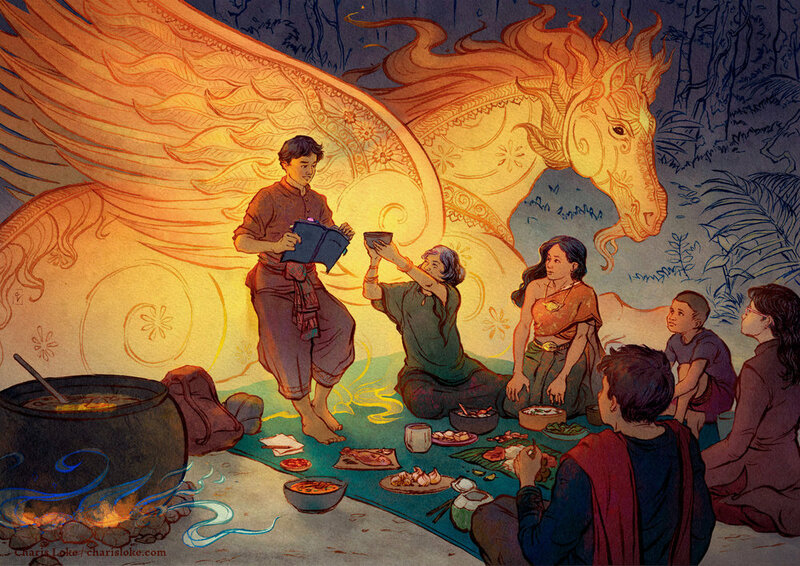 A LIFE BEYOND BOUNDARIES: Cover illustration for Gerakbudaya. Read more. SORCERERS ROYAL: alternative cover for Zen Cho's 'Sorcerer to the Crown'. See the process behind this image. MAGIC AND MAYHEM: character portraits for Zen Cho's 'Sorcerer to the Crown'. 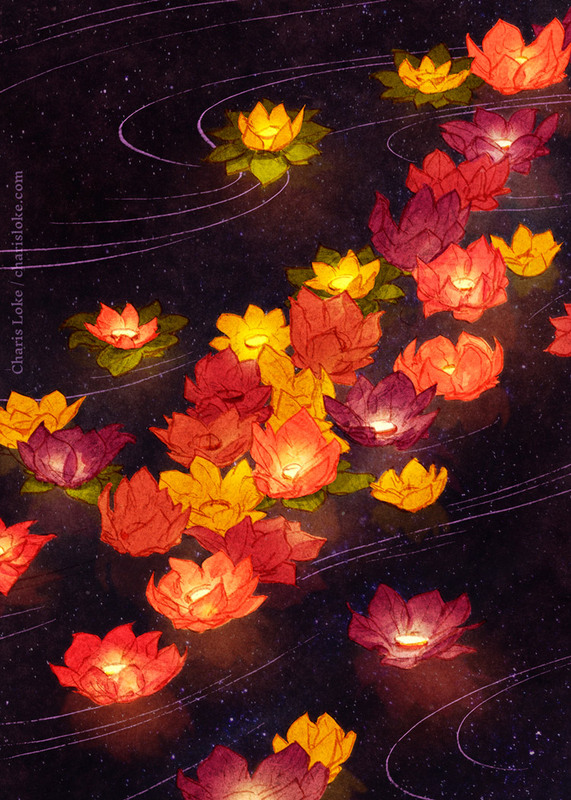 RIVER OF LIGHT: for ‘Small Art for a Big Cause’ at Light Grey Art Lab. A LIGHT IN THE DARKNESS: for ‘ Color Anthropology’ at Light Grey Art Lab. Read more. OMELAS: based on a short story by Ursula LeGuin, created at the IMC 2018. Read more. LONGEVITY: for ‘FOODIES’ at Light Grey Art Lab. CRACKDOWN: illustration for ‘Silenced by an Elastic Law’ on New Naratif. IMAGINATION: illustration for Singapore International Foundation. LISTEN: illustration for 'Rules for Communing with Spirits' on Fireside Fiction. GEEKY BAJU: Southeast Asian garment designs based on literature, video games, and film. KEJORA: writing and art inspired by Southeast Asian cultures and realities. A NATION VOTES: sketch reporting from Malaysia's 14th General Elections for New Naratif. Read all three illustrated articles here. 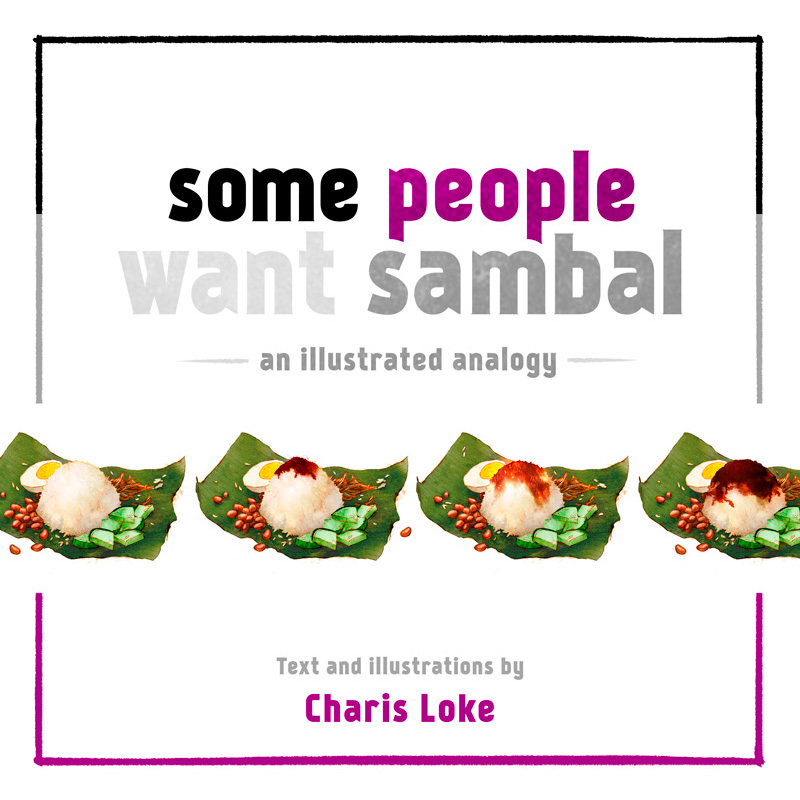 IS WANTING SAMBAL NASI-SSARY? An introduction to asexuality for Queer Lapis. I'm a Malaysian illustrator and artist working in ink, watercolour, and digital media. Drawing from literature and visual culture, I make pictures that evoke a sense of wonder and curiosity. My work brings to life fictional worlds and current issues for books, magazines, games, and more. 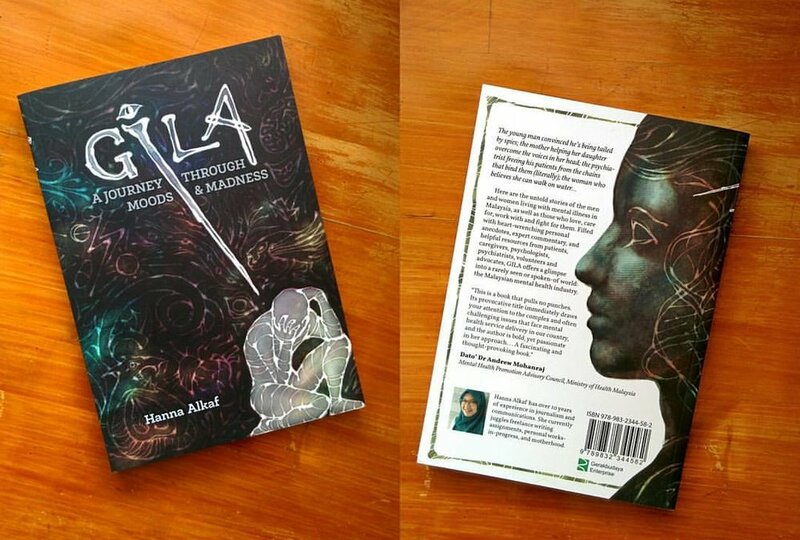 Wraparound cover for GILA by Hanna Alkaf. George Town Literary Festival, New Naratif, Gerakbudaya, Editions Jentayu, Esquire Malaysia, Fireside Fiction, Tenaganita, ABAAD. Designs based on Dragon Age: Inquisition for the Geeky Baju Project. I enjoy developing cool ideas on my own and working on projects with others. At the Projects page you'll find geeky Southeast Asian garments, protest flower posters, zines, and more. Events/clients include: Tokyo Fintech Summit, TEDxKL, Cambridge Assessment English, PwC HK, Wharton Global Forum HK 2017.